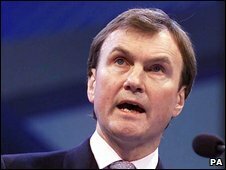 ITV has appointed former Asda chief executive Archie Norman to replace Michael Grade as chairman in January. Mr Norman is credited with turning around Asda in the 1990s, before its sale to US retailing giant Wal-Mart. He will be paid an annual salary of £300,000, and will be given 1.2 million shares in ITV during the next three years - 400,000 each year. Candidates linked with the vacancy in the past months include Sir Crispin Davis, who led publisher Reed Elsevier. Shares in ITV were up as much as 5% during the day, closing up 3%, or 1.8 pence, to 53.75p. Mr Norman said: "There are few opportunities that would have tempted me back into the public company arena, but ITV is definitely one of them. "It is an irresistible challenge, a great brand, a people business with enormous talent, but facing an imperative for change - the challenge of adapting to compete in a fragmented digital media world." The former Conservative MP helped build up Kingfisher, which owns DIY chain B&Q, in the 1980s. He was appointed Asda chief executive in 1991 and grew the business for eight years before its sale to Wal-Mart. "We are delighted that Archie is to become the next chairman of ITV," said Sir James Crosby, chairman of the nomination committee and spokesman for the board. "He has an outstanding track record in business and we believe that his extensive experience of both business and public life will be of significant benefit to ITV in the years ahead." Sir James also announced his intention to resign from the board once a replacement had been found. One of the first tasks Mr Norman will face will be to find a new chief executive for the broadcaster. ITV has been looking for a new chief executive since since April. Talks with Tony Ball, the former boss of Sky, about taking on the role broke down in September. The broadcaster has been struggling during the downturn as advertisers cut back on spending. Earlier this month, it said revenue for the first nine months of the year came in at £1.31bn, down 11% on the same period in 2008, while last month it said it was looking to raise £120m to reduce its debts by selling bonds.